Black twinberry at various stages of development. 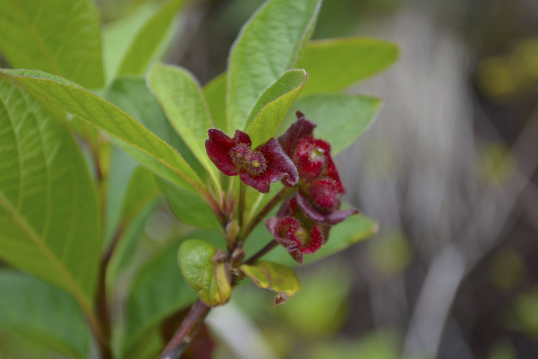 Clockwise from bottom left: twinberry flowers, bracts before berry development (photos by Kelly Fretwell), red bracts during berry development (photo by Christian Kelly), small bush during berry development (photo by Sarein Basi-Primeau), and developed berries (photo by Caylie Boos). 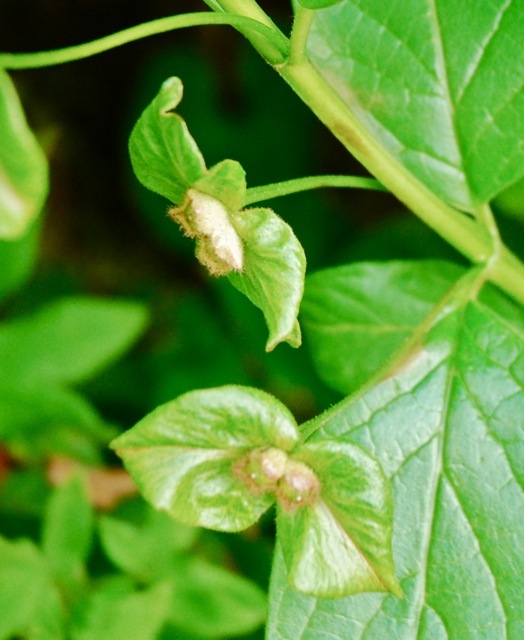 Black twinberry is a deciduous shrub that grows in an upright or scraggly manner, usually to 3 m tall though it can reach nearly 5 m. Its greenish branches bear bright green oval-shaped and pointed leaves that occur in opposite pairs. 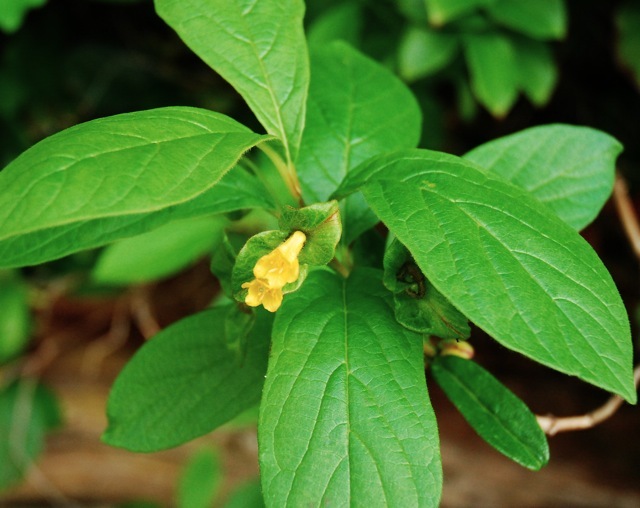 It has yellow tube- or trumpet-shaped flowers measuring 1-2 cm long, that appear in pairs and hang down below the leaves (in the leaf axils — the area between the leaves and the stem). The flowers are surrounded by green or purplish bracts that darken to deep purplish-maroon during berry development.. The shiny black fruits are paired as well, as per the plant's name. Black twinberry is found in moist to wet areas like streamsides, near swamps, fens, and other water collecting sites. It can tolerate both sun and shade, so can grow in moist forests as well as clearings. It grows in nitrogen-rich soils at low to subalpine elevations. This species is found throughout most of British Columbia, and grows in some select coastal areas of Alaska. It is also found across most of northern and western North America. Utah honeysuckle (Lonicera utahensis) could be confused with black twinberry as it has similar leaves and paired fruits and flowers. However its leaves are more rounded, it has red berries, and it is missing the bract under the flower and fruit pairs. Its range is different as well - it is found at higher elevations, including the Olympic and Cascade mountains. The berries are not considered edible, and in fact based on some reports they can be mildly toxic or poisonous to humans. Other reports label them as simply bitter and unpalatable, while a few label them as edible and a useful food source. Some coastal First Nations groups have some traditional beliefs and taboos against eating them. The berries did have some other traditional uses, including pigmentation for dyes and to prevent grey hair. The bark and twigs had traditional medicinal uses for issues such as gastrointestinal problems and contraception. Uses also vary between First Nation groups. The 'ethnobotanic' section of this article lists uses reported in the United States. 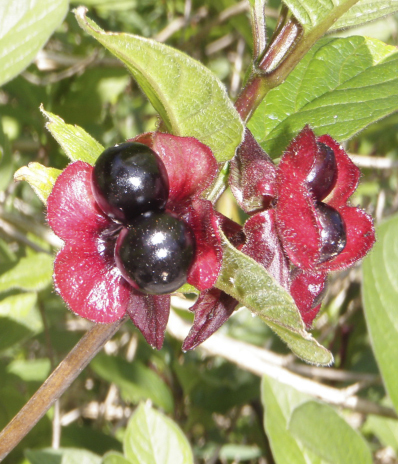 Black twinberry has some conservation uses. Its presence can help prevent streambank erosion, and live stakes can be used for bioengineering of eroding streambanks, shorelines, and other slopes. It is also valuable in general restoration of riparian zones and other moist to wet areas, and for hedgerows. Black twinberry berries are eaten by a variety of animals such as birds, bears, and small mammals. The flowers are a perfect source of nectar for butterflies and hummingbirds - hummingbirds especially love such trumpet-shaped flowers. Darris, D. (2011). Plant fact sheet for twinberry honeysuckle (Lonicera involucrata). USDA Natural Resources Conservation Service, Corvallis, OR. Accessed 03/07/2013. Lonicera involucrata (Richardson) Banks ex Spreng. In Klinkenberg, Brian. (Ed.). 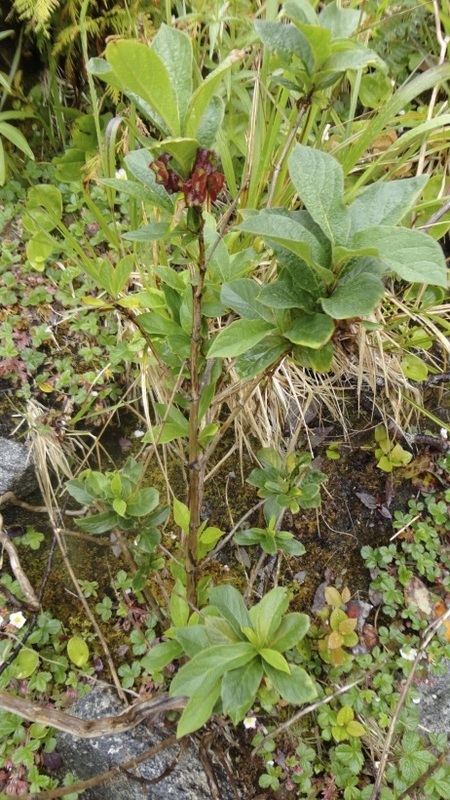 E-Flora BC: Electronic Atlas of the Plants of British Columbia. Lab for Advanced Spatial Analysis, Department of Geography, University of British Columbia, Vancouver. Accessed on 03/07/2013. Pojar, J. and MacKinnon, A. (1994). Plants of Coastal British Columbia, Revised. Vancouver, BC: Lone Pine Publishing. P. 69.